We are now talking about one insane restoration job! 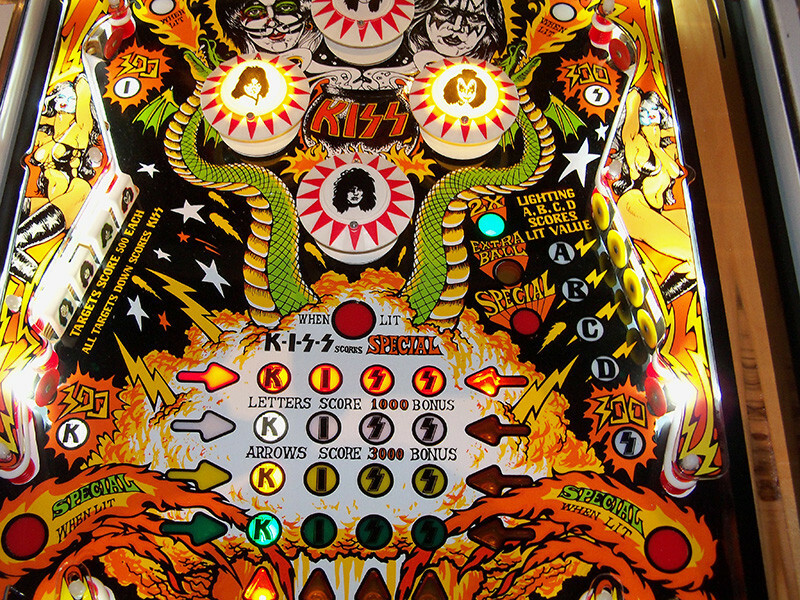 It is hard to have a “Brand New” 1979 Bally pinball machine, but, this is as close as I've ever come to one. Jim Patla headed the design team and Kevin O'Connor out did himself on the art. 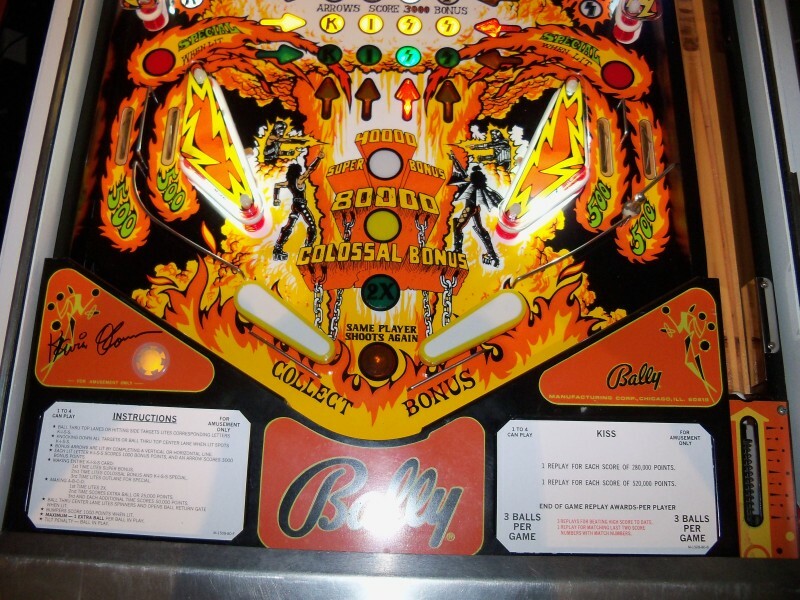 Let me tell you about this machine: “Sherman, set the Way-Bak machine for about 10 years ago…” Gene Cunningham bought the physical assets of Bally/Williams when they closed. 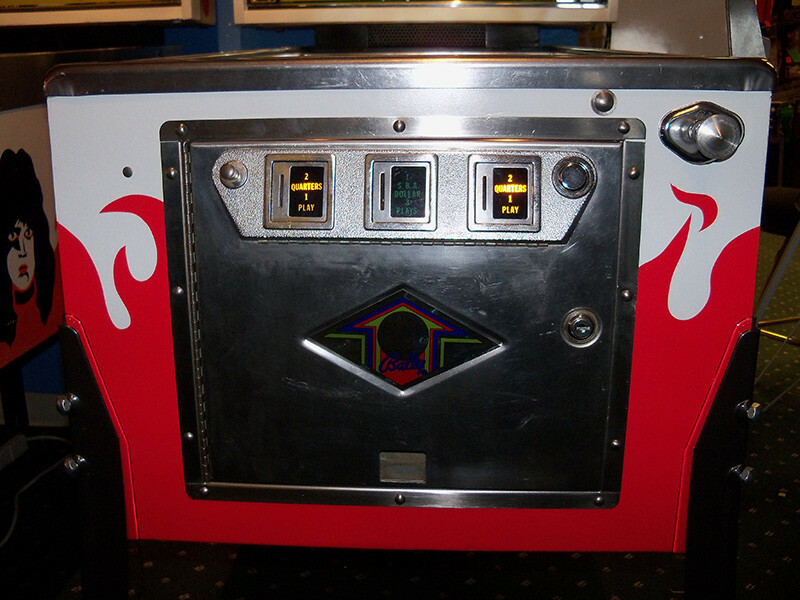 He adventured into the extra step and re-manufactured several playfields and backglasses. 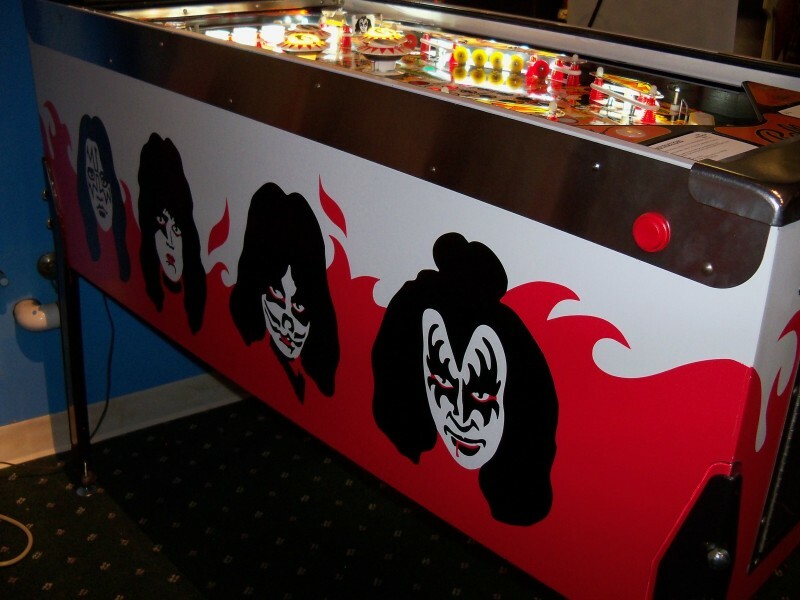 So, whatever Pinball Expo he was selling them, it seemed like a good idea and I purchased the KISS set. 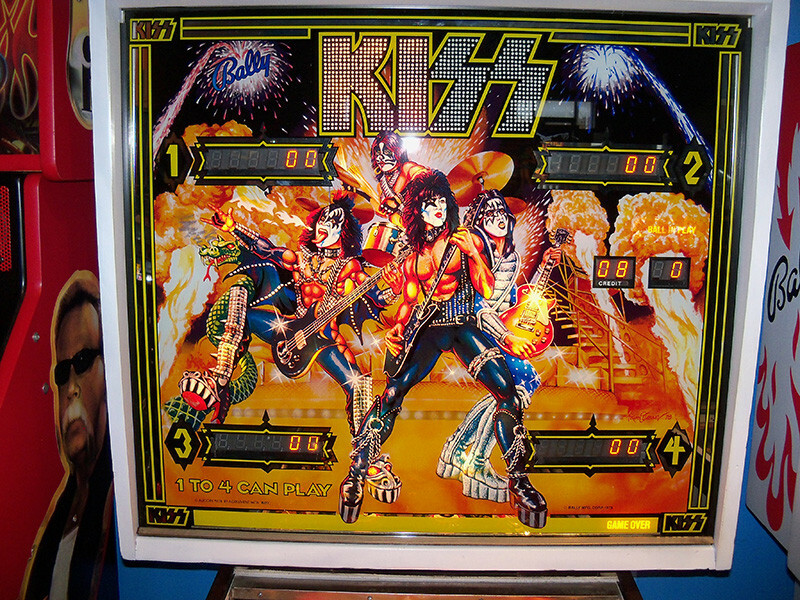 The playfield hung on the wall for years. The glass hidden safely in a box. Waiting. Waiting. Patiently waiting for the opportunity to do what they were meant to do: bring an old game to its original glory! 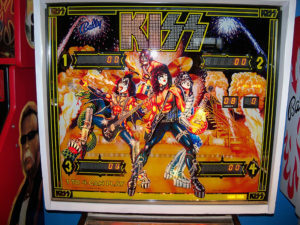 Last year, I had the good fortune to come across a couple typical KISS machines. Between the two, we built one nice one that I kept, the junker I sold last year real cheap. Ron waited until he was ready to tackle the tedious task of rebuilding the top and bottom of the playfield. The underside is almost all original. When he top started the top, one thing led to the other: lets use brand new bumpers! Steveo is a fanatic about using new posts. Hey, there's a repo plastic set available, drop targets with faces (kewl!) and on and on! Then, the cabinet! 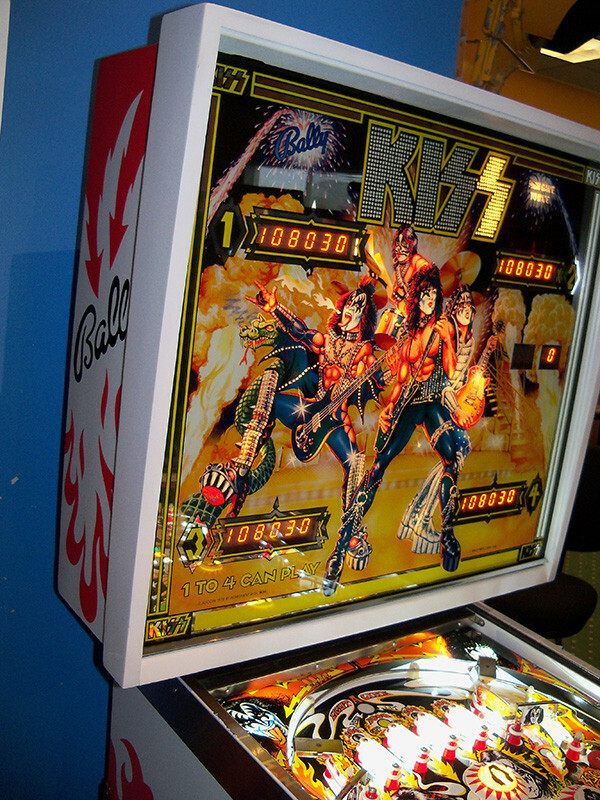 We learned of a skilled craftsman who had been successful repainting KISS cabinets. Wow, that is correct. we've gone this far, new side rails and plunger. Cash door is original. New legs (with plastic cabinet protectors). Then the question: LEDs or not? Wow, they sure look great! after all, the new lamp driver board will support LEDs. Boards: new aftermarket CPU, driver board and auxiliary lamp driver. The power supply and sound board are original. If you flinched at the price, you probably haven't read this far. If you have, now you understand what went into this museum quality show piece! This is not the game to “buy for the kids,” that one is next to it.